Commencement was held yesterday and it was a great day at Wake Forest. 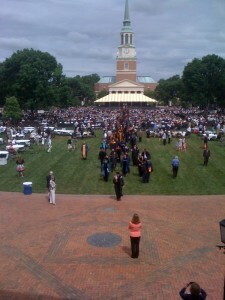 Though there was the threat of rain, it held off for the Commencement ceremony and in many respects was an ideal weather day. It was a little bit overcast, and a touch on the cool side, but having sat through a number of low 90s Commencements in full sun, I can tell you that the lower temp/lower sun combo is much preferred. 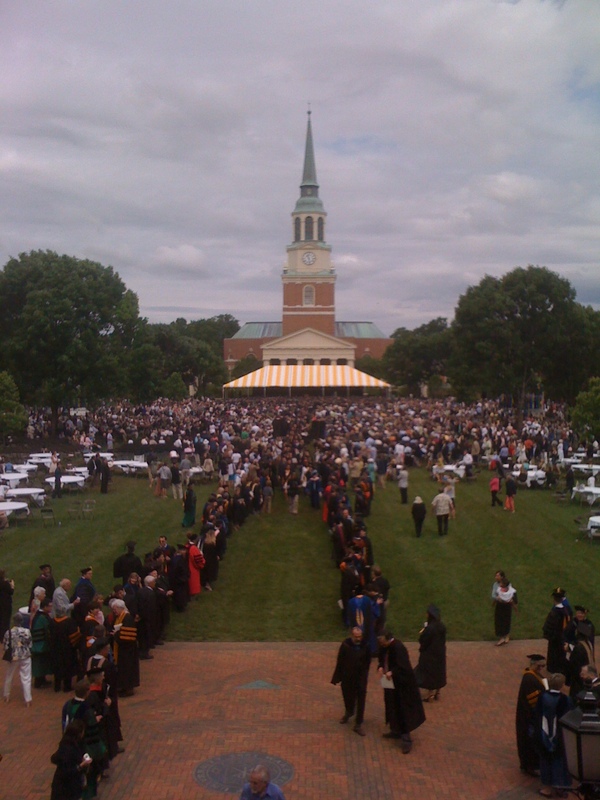 The WF News service has put together a full page of Commencement afterstories, so you can go online and watch a recap of the speeches, download the programs and more. As for the Daily Deac, our favorite part of Commencement comes at the very end. The ROTC cadets are commisssioned, and ever since 9-11 that has become an especially compelling part of the day, because we know our young men and women are entering into military service at a time when the stakes are incredibly high. Our cadets got a standing ovation when they went to the stage. It’s a great moment. Following the commissioning and the closing benediction, the President, Provost, Deans and the platform party of faculty members walk through the Quad grass back to Reynolda. 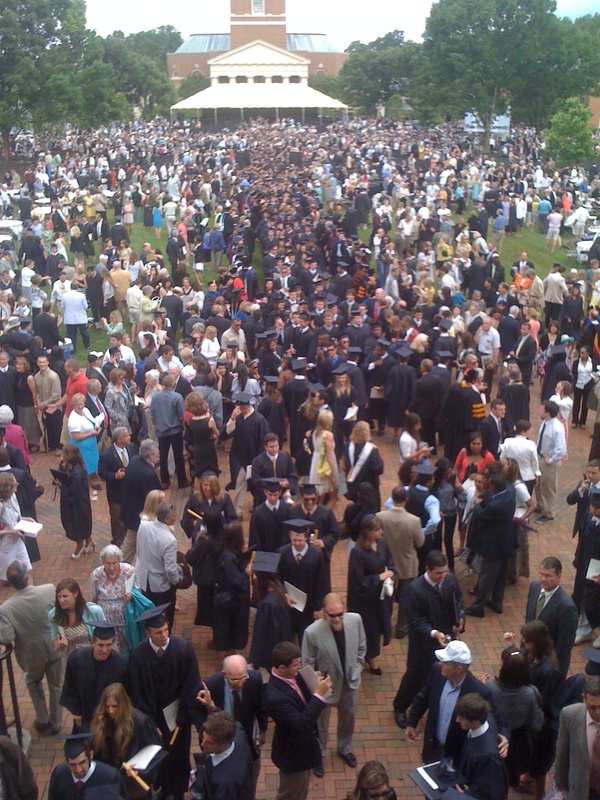 They stop there in two rows, and the graduates march through them. As the graduates pass, they stop when they reach their favorite faculty members to hug them or shake hands. My colleagues and I always watch from the balcony and it really is a lovely thing to see. The friendships formed here – between classmates, faculty or administrators – are very real and very special. 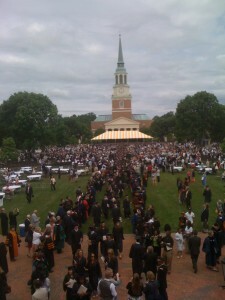 Here are a few [non-professional] pictures of the recessional and the line walk. 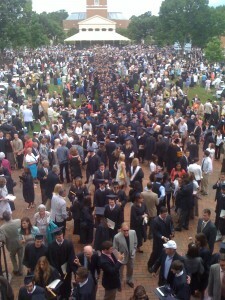 Congratulations again to the Class of 2011 and their families and loved ones who joined us for Commencement. Welcome to the alumni family!